Location – If you’ve ever visited the area, you’ve for sure seen the deserted island right offshore and maybe even daydreamed about paddling out there. That Island is called Isla Capitán. 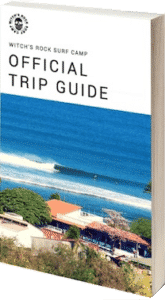 Isla Capitán is located about 1 km southwest from the Tamarindo Beach Break and about 400 meters west from the Capitán Suizo surf break. Isla Capitán is somewhat of a mysto-spot that is rarely surfed but can get very good. Isla Capitan has a right-hand slabbing wave on the south side of the island and a long, pinwheeling left hander on the north side of the island. Many people have daydreamed of surfing the right-hand slab, but it is mostly unsurfable as there is a dry reef section that pops up mid way down the wave. The left is a little bit more popular and has been surfed by a few kamikaze locals on monster swells. Neither of the waves are perfect, but they offer plenty of raw ocean power. 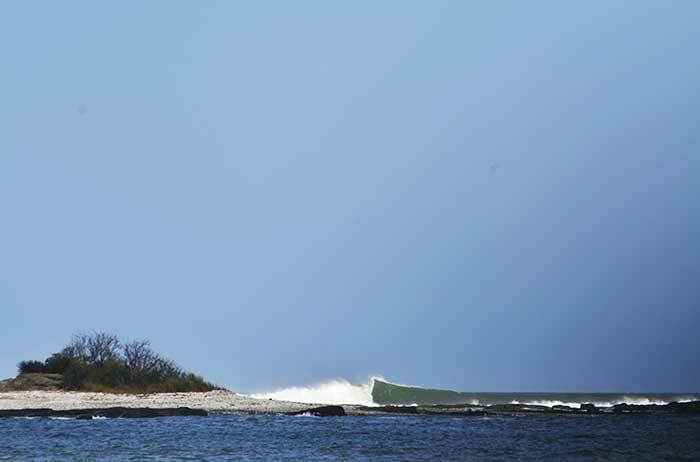 Since Isla Capitán sits just outside of Tamarindo Bay, the swell window is wide open. Straight South swells along with steep North swells will directly impact the island. Ideal Wave Height – Overhead – Double Overhead. Don’t even bother trying to surf Isla Capitan if the swell is medium sized. In order for the waves to work, there needs to be one of the top 5 swells of the year happening. If the swell is not overhead, the waves will break on top of the rocks and not be surfable. Best wind is very light offshore which can range from NNE to NE to ENE. If the wind is blowing too strong offshore, there will actually be little ripples going in the opposite direction of the swell which can make for an extremely bumpy ride. Light winds are ideal here. Bring some rubber especially if the winds have been blowing offshore for several days. Although rare, water temps can drop down to about 63°F. This is a phenomenon called upwelling. Normally, water temps hover in the 75° – 80°F range. Upwelling really only happens a few times during the dry season. A wetsuit top generally comes in handy for dawn patrol sessions year round. July and August are known as Costa Rica’s “Mini-Summer” months where we receive consistent SW swells and offshore winds. This is your best chance of scoring an XXL swell large enough to light up the island. December – March is when we receive our NW with the longest periods of the year and possibly the biggest surf. Low tide is the only time to catch rideable waves on Isla Capitán. With the low tide, the waves will break far enough off the rock / reef to be a little safer. It is questionable if the right hander is even surfable. The left hander is a fast, pinballing wave that comes from deep water and retains all its power. Only experienced big wave riders should even attempt surfing here. A jet ski would be ideal for safety and transportation. You need to match power with power. The waves move very fast at Isla Capitan so you need as much paddling power as possible. Even though the island appears to be mostly sand, the perimeter of the island is lined with rocks and reef. There are a few large boulders sitting out there as well to be aware of when surfing. Chances are you and your buddies will be the only ones brave enough to surf here. If you have a jet ski to tow into the waves and to transport you to the beach, that would be the ideal scenario. As the wave comes out of deep water, it retains all of its power and speed. Those who have surfed Isla Capitán claim it’s the most powerful wave in the area. On an ideal day with the perfect swell angle, very light offshore winds, and solid size, the left offers a powerful deep water wave that will wrap partially around the island. There are a few rocks in the line up to dodge. Not much of a barrel, but a fast wave that will give you speed wobbles. The right hander is extremely fickle and is rarely surfable, but it sure looks fun to mindsurf on those rare XL swells. From the beach in Tamarindo, the paddle takes about 40 minutes. You must time your session with the tide. Paddle out with the dropping tide, surf during the dead low, and then paddle back in with the incoming tide. If you do not follow this schedule you may be sucked out to sea with the insane current that filters through the island and the point. The shortest paddle to Isla Capitán is made by first walking south to Capitan Suizo and then paddling straight out from there. Paddle out with the dropping tide, surf with the low tide, and paddle back in with the incoming tide. If you do not follow these instructions, you may be lost at sea. Also remember that during the December – March timeframe Tamarindo receives offshore winds almost daily. These heavy offshore winds can make it very difficult to paddle back to the beach.